Apple is rumoured to have cancelled its iPad 3 supplies which were scheduled for the second half of 2011. The company was originally set to launch the next version of the iPad in the second half of 2011 with a supply volume of 1.5 to 2 million units in the third quarter and 5-6 million in the fourth quarter; however it has been recently discovered that the related figures have all already been deleted. According to sources, the main reason behind the delay is the 9.7 inch display panel which has a resolution of 2048×1536. These panels are mainly supplied by Japan-based electronics giant Sharp, with a high price and Apple’s other supply partners Samsung and LG are both unable to provide such high quality display. Sources from panel players also pointed out that the 9.7 inch panel with high resolution requires a much larger backlight source and a single edge light bar is hardly able to reach satisfaction levels. Due to iPad 3’s requirements over the physical thinness, rich colour support and toughness will all conflict with the panel’s technology restrictions; therefore, this could cause a delay in the launch. 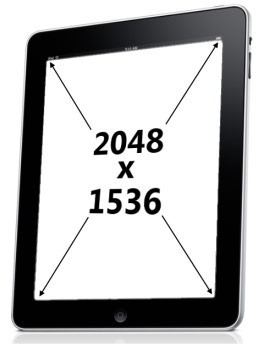 Well, atleast now we know that the next iPad will be launched next year and will have a high resolution display figuring at 2048×1536 pixels.